The department of Electronics & Communication Engineering was established in 1999 to run four year B.E./B.Tech. program in Electronics & Communication Engineering (ECE). 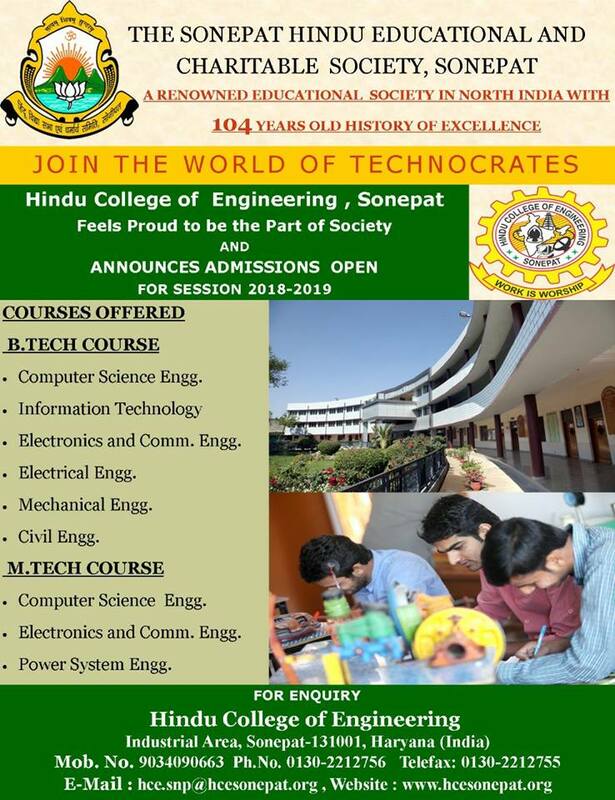 The department covers a host of subjects inclusive of Electronic Circuits, Microprocessor, Digital Signal Processing, Communication System, Digital Electronics, Mobile communication, VLSI, Embedded systems, Instrumentation, Wireless Communication, VHDL, Analog Electronics ,Power Electronics , Field & Wave, Linear Integrated Electronics ,Microcontroller, Microwave & Radar, Satellite Communication etc. The department has laboratories catering to all the subjects of studies. The Department has highly motivated faculty pool to cater our needs. To become a leading department of its kind to excel in value based Technical value & Research. Dramatic increase in product oriented research for establishing a self-sustaining and wealth creating centre by involving the interaction between committed, diverse faculty, staff, students and community, to serve the societal needs of the State of Haryana, India and ultimately, the world. The department has also started M.Tech. program in Electronics & Communication Engineering from session 2010-2011 onwards. The Electronics & Communication Engineering has gained a lot of importance because of the rapid growth as well as amalgamation of electronic circuitry, software, and computers and in the field of various communication techniques. The department has set up state of the art laboratories for M. Tech. program to cater the need of present competitive scenario and innovations in upcoming technologies. In near future, the college targets to establish a research centre in Electronics & Communication department. The college has membership of INDEAST-AICTE Consortium to access IEEE on line e-journals. The students at undergraduate course are exposed to provide the basic understanding of hardware and software as employed in electronics and communication engineering. The students are provided in depth knowledge of core subjects for teaching like electromagnetic theory, Digital signal processing, Microelectronics, Data Structure, Control System, data Communication, Microprocessor and Microcontroller, Antenna & wave propagation, Industrial Electronics, Microwave and Optical communication, VLSI Design and Advance fabrication systems. A six week Industrial Training after 4th and 6th semesters and Minor/Major projects in 7th and 8th semesters provide and exposure to latest technologies used in electronics and telecommunication industry. Electronic Engineering continues to be a buoyant industry, as indicated by the current demand for graduates. These courses are designed to qualify student for careers in a wide range of industries, as well as in government and commercial organizations. These typically embrace power electronics, information technology, electronic hardware and software, automation, robotics and control, communications, radio and television, computer engineering, solid – state devices, microelectronics and VLSI.